This week's Top Ten Tuesday topic is New-to-Me Authors I Read In 2018. I discovered quite a few new authors last year, and these are the ten I liked most. 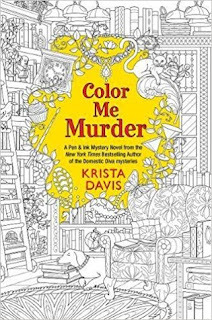 I listened to the audiobook of book one of Davis's Pen and Ink series, Color Me Murder, in April, and I was really impressed by how well-written it was compared to other cozy mysteries. 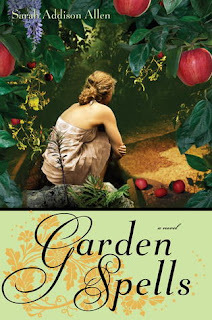 I also realized for the first time how much more I enjoyed audiobooks when I listened to them at double speed, and ended up reading quite a few other cozies in that format, including The Diva Runs Out of Thyme, also by Krista Davis. I bought two more books from the Diva series in paperback, and my mom gave me the second Pen and Ink book for Christmas, so I'm planning to enjoy those in 2019. Vivien Chien's Noodle Shop Mysteries were another great discovery in 2018. 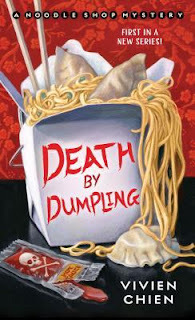 I read an ARC of the first book, Death by Dumpling before its publication in March, and loved it instantly. It seemed like it took forever for the second book to become available on NetGalley, but when it did, I requested it immediately and read and reviewed Dim Sum of All Fears before it came out in August. The third book, Murder Lo Mein, is coming soon, and I can't wait! 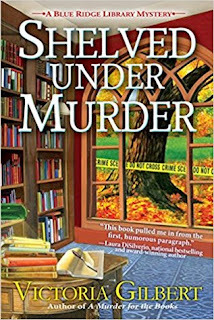 I listened to the audiobook of the second book in Victoria Gilbert's Blue Ridge Library Mystery series, Shelved Under Murder, mostly because of the library setting, and I was impressed from the beginning with both the details about daily work in a public library and the well-developed characters. I haven't yet gone back to read book 1, but I have an ARC of the third book, Past Due for Murder, which comes out in February, and I'm really looking forward to visiting with all those characters again. After reading several Sarah Dessen books over the summer, I wanted more teen summer romances. I had enjoyed Kasie West's By Your Side early in the year, so I decided to try a couple more of her titles. While cleaning during our move at the beginning of August, I listened to On the Fence and Listen To Your Heart. I also ended up buying the Kindle edition of Snow in Love solely because West has a story in it. Next I'll be reading a digital ARC of her February 2019 release, Fame, Fate, and the First Kiss, from Edelweiss+. I tried and failed when I was a librarian to read The Summer I Turned Pretty and Shug, but I decided to try this author once more with her Lara Jean series. 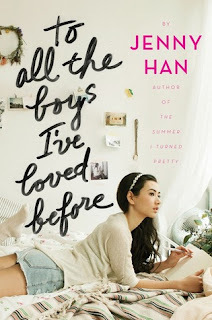 I read the first one, To All The Boys I've Loved Before, in January, and loved it. Then I watched the Netflix movie when it came out in August, and listened to the other two books on audio in December. I'm excited for the movie sequel to come to Netflix! I have known of Hank Green as one of the vlogbrothers ever since I first read a John Green book during my teen librarian days. 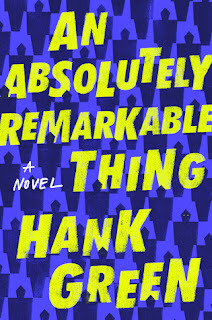 I went into his first novel, An Absolutely Remarkable Thing, with very low expectations, kind of assuming he was only getting published because he's a YouTube personality with a famous author for a brother. But I was so wrong. The book was so good! I'm a little wary of a sequel since I liked the ambiguity of the ending of the first book, but I definitely plan to read it. I read the first of Patricia Cornwell's Kay Scarpetta books a few years ago, but then put the rest of the series on the back burner. 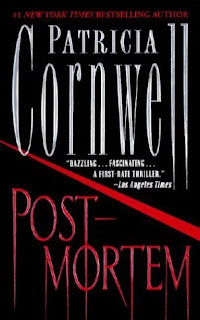 This past year, faced with the fact that I only have one Sue Grafton book left to read, I decided to try Cornwell again, and listened to the first two books on audio. This time, it seems to have stuck, because book three, All That Remains, was my second read of 2019. 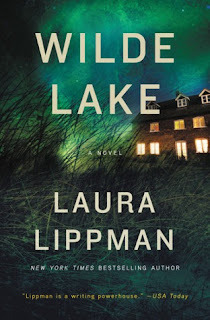 I was looking for an interesting audiobook this spring, and chose Wilde Lake by Laura Lippman at random. I enjoyed it so much that I got started on the author's Tess Monaghan series. I read three of those in 2018, and I bought a bunch more in paperback to read this year. 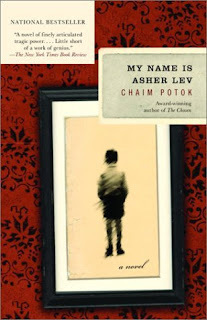 My unofficial Well Read Mom book club read My Name is Asher Lev in October, and I just fell in love with the writing style. I really want to read the sequel this year. I read I'd Rather be Reading by Anne Bogel in September when it was making the rounds on #bookstagram, and in it, she mentioned some of Sarah Addison Allen's books. I don't usually like fantasy, but these sounded so good that when I saw Garden Spells available as an ebook from my library, I gave it a try. I enjoyed it so much that I also bought Allen's First Frost for Kindle. It's on my 2019 TBR. Have you read any of these authors? Which authors did you discover in 2018? I still haven't read any of these authors. Maybe this year! I read Jenny Han for the first time last year, too. She's a great writer. Death by Dumpling sounds like an interesting read. Thank you for the recommendation. I like cozy mysteries, but only if they're written well. Or at least better than average, you know? The ones you listed sound good. I'll have to check them out.